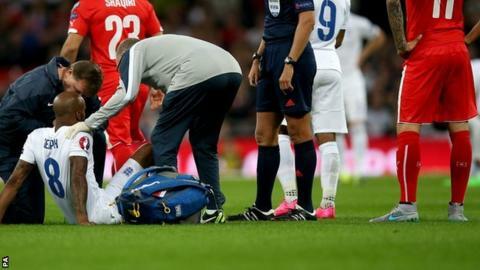 Manchester City's Fabian Delph is expected to be out for six weeks after picking up a hamstring injury playing for England in their Euro 2016 qualifier against Switzerland. The 25-year-old midfielder pulled up in the first minute of Tuesday's game at Wembley, which England won 2-0. City manager Manuel Pellegrini said of Delph's prognosis: "I don't know how long it will be, we'll see. "I think at this moment it will be a month and a half." Delph signed a five-year contract at the Etihad Stadium in July - less than a week after saying he would stay at Aston Villa, where he was captain. He also picked up a hamstring injury on his pre-season debut for City, during their game against Real Madrid in the International Champions Cup in Melbourne. Delph returned to action as a substitute in his side's Premier League win over Everton on 23 August and also came off the bench in their victory over Watford before the international break.